The Kirkcaldy MP was speaking after allegations that newspapers had accessed his family's personal records and bank details. Former Prime Minister Gordon Brown said he was "genuinely shocked" to find out a newspaper had used "known criminals" to gather information about him. The Kirkcaldy MP was speaking after allegations that News International titles accessed his family’s bank, medical and legal records to get stories on the then Chancellor. Mr Brown said that a story in the Sun newspaper detailing his son Fraser’s medical condition reduced him and his wife to tears. On Tuesday, NHS Lothian said that they would look into any allegations made against staff at the hospital where Fraser was born. Mr Brown spoke about a story in the Sun newspaper about his son Fraser being diagnosed with cystic fibrosis. Rebekah Brooks called the politician to tell him that the paper had the story and were going to run it. Speaking about it, Mr Brown told the BBC: "They told me they had this story about Fraser’s medical condition and that they were going to run this story. "(We were) in tears, your son’s now going to be broadcast across the media. Sarah and I were incredibly upset about it. "We were thinking about his long term future, we were thinking about our family but there’s nothing you can do about it, you are in public life and this story appears you don’t know how it appears. I have not made any claims about how it appeared but the fact is it did appear and it appeared in the Sun newspaper." 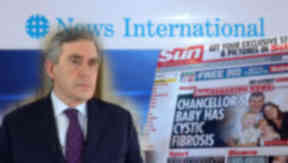 On Tuesday, News International denied The Sun newspaper had accessed the medical records of former prime minister Gordon Brown's son Fraser, saying "the story had originated from a member of the public". Fraser was born at Edinburgh Royal Infirmary in July 2006 and the health board that runs the hospital said they would investigate any claims staff there leaked the information. Dr David Farquharson, medical director at NHS Lothian, said: “We take any breach of patient confidentiality very seriously. If anyone has evidence that a member of our staff has breached patient confidentiality we would ask them to contact us as a matter of urgency to allow us to carry out a full investigation. Mr Brown also spoke about claims The Sunday Times obtained information from the politician’s bank and legal team to run a story on a property he had bought in London. Mr Brown said: "I think that what happened pretty early on in government is that the Sunday Times appear to have got access to my building society account. "They got access to my legal files, there is some question mark about what happened to other files - documentation, tax and everything else. "I'm shocked, I'm genuinely shocked, to find that this happened because of their links with criminals, known criminals, who were undertaking this activity, hired by investigators with the Sunday Times. "If I, with all the protection and all the defences and all the security that a chancellor of the exchequer or a prime minister has, is so vulnerable to unscrupulous tactics, unlawful tactics, to methods that have been used in the way that we've found - what about the ordinary citizen? "What about the person - like the family of Milly Dowler - who were in the most desperate of circumstances, at the most difficult occasions in their lives - in huge grief and then they find that they are totally defenceless in this moment of greatest grief from people who are employing these ruthless tactics?"